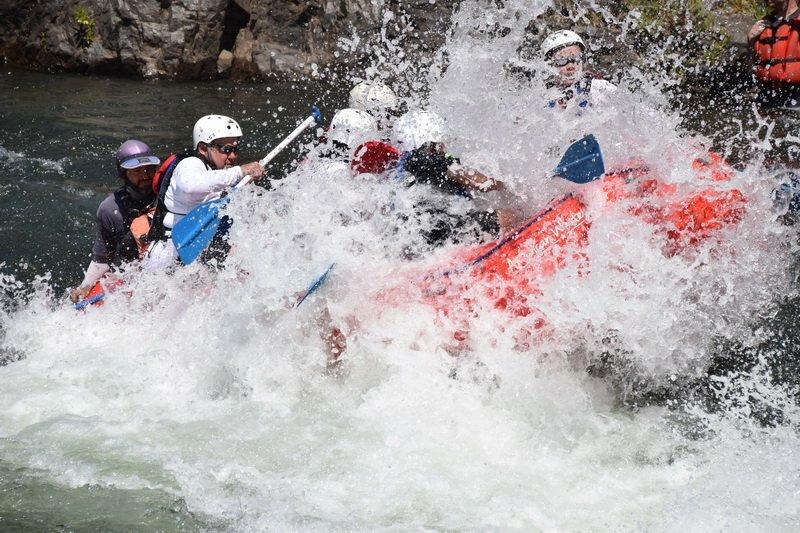 Full Day Rafting Trip on the South Fork of the American Whole River. 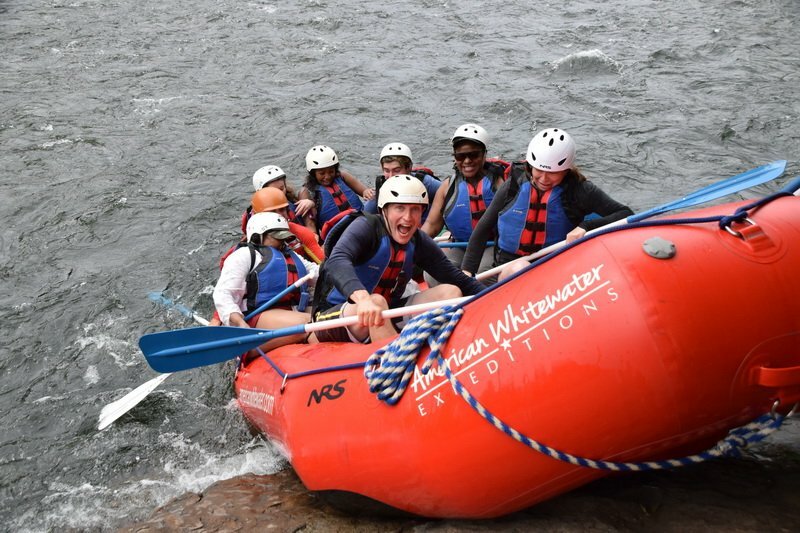 Are you looking for a super full day of whitewater rafting on a river that’s just packed with fun, excitement, and thrills? Then this is the trip for you! You’ll raft the entire 21-mile length of the legendary South Fork of the American River from Chili Bar Dam to Folsom Lake. 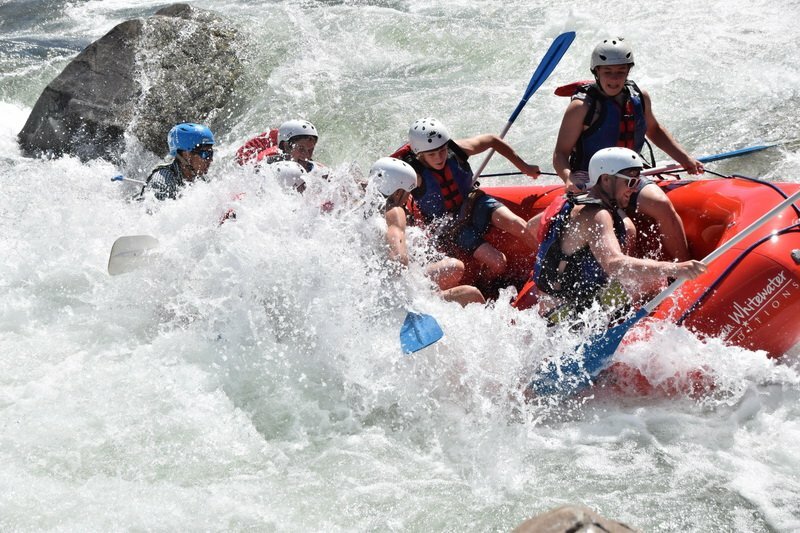 Rafting the South Fork of the American is one of the countries most popular rafting trips and is quite the experience. Little do people know that the South Fork of the American changed world history in 1848 when California’s first gold was discovered in its river-bed at an old logging site at Sutter’s Mill. This discovery of gold triggered the California Gold Rush of 1849, often considered the largest human migration for a single purpose since the Crusades. Unfortunately, once the easily found gold was taken away, the miners made an absolute mess of the natural surroundings with their hydraulic pumps, causing people downstream to grumble. Pretty soon the mining operations were shut down, and today you can still find huge trenches created by the miners some 150 years ago. 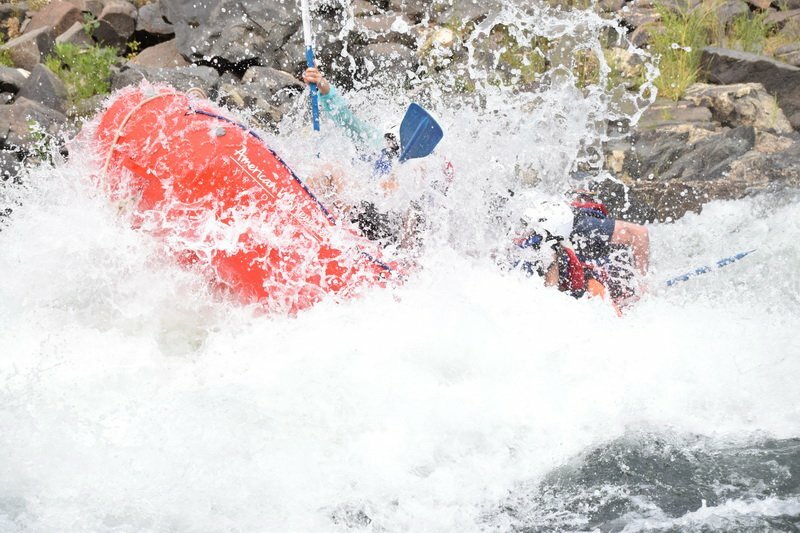 The South Fork has shaped our entire region and is still one of the most popular rafting trips in America. James Marshall Gold Discovery State Historic Park brings California’s history to life and our deluxe campground is located smack in the middle of it all! So come stay with us and camp the night prior to your South Fork rafting trip for free at our deluxe campground or arrive the morning of your trip by 8:30 AM. If you choose to stay with us the night before, our shuttle will drive you to the top of the South Fork to the Chili Bar put-in. After a last minute restroom break, you will get geared up, attend a detailed safety talk, and then you’re off on the water. The fun starts right off the bat. Paddle your way through rapids such as Meat Grinder, Triple Threat, and the famous Troublemaker. Halfway down you’ll take a break for a yummy and hearty lunch served riverside. Then you’ll head downstream to the Gorge, a canyon filled with rapids such as Fowlers Rock, Satan’s Cesspool, Bouncing Rock, and Hospital Bar. After the last rapid our Honda Jet Ski will tow the rafts across Folsom Lake to the take-out at Salmon Falls. Ice-cold beverages will be provided and our shuttle will take you back to the deluxe campground between 4:30 and 5:30 PM. 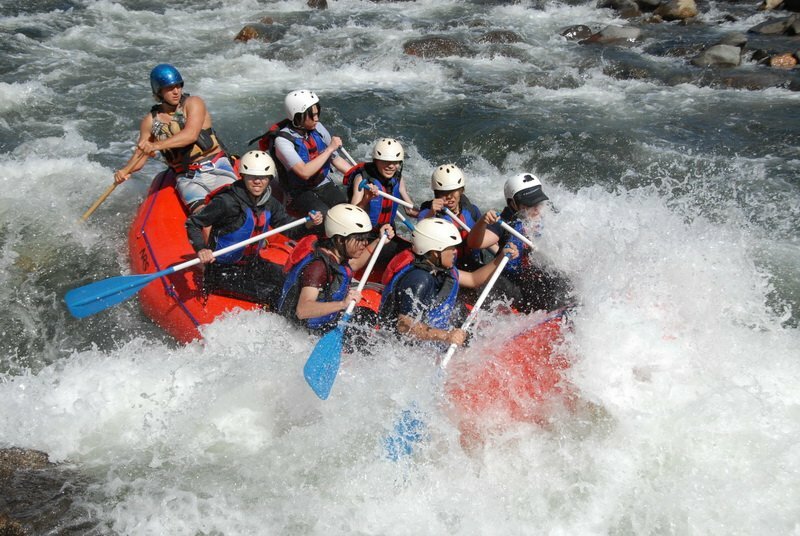 The South Fork Whole River rafting trip is offered every day of the week departing from our River Camp in Coloma. Click for Directions. This South Fork rafting trip leaves our River Camp at 9:00 AM so it’s imperative that you arrive by 8:30 AM at the latest. You can also choose to camp with us for Free the night before. Additional nights camping and meals are available before or after your trip with advanced reservation only. Please call 1-800-825-3205 or email us for details. 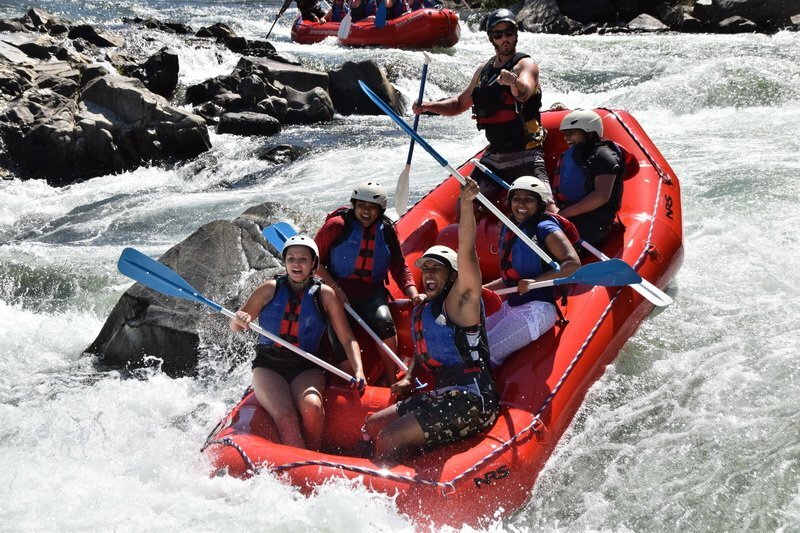 Get ready for a fun filled day rafting the South Fork of the American River! Check out our Equipment List for items you will need for your rafting trip as well as Maps and Directions to our River Camp. Group Specials For every 5 paid rafters the 6th goes for 50% off. For every 11 paid rafters the 12th goes for FREE. Large Groups of 12+ please call for Special Group Pricing. NOTE: Youth price are for ages 6 to 16. Prices are per person and there is an 8% Govt Land & River Use Fee added to all prices above.